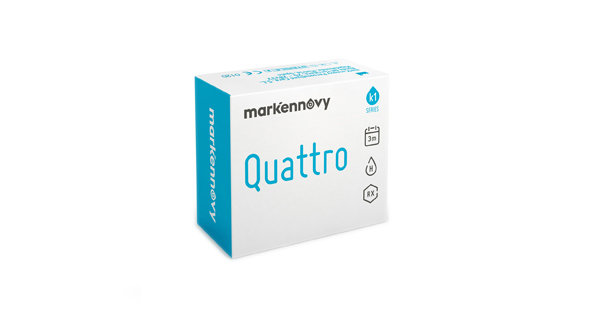 Do not hesitate to buy Mark Ennovy Quattro contact lenses, conventional lenses always renewed as ever. Quattro is one of the most outstanding brands of cheap contact lenses manufactured by the important multinational Mark'Ennovy. These online lenses are manufactured with the most advanced technology in material Filcon I 1 49% (hydrogel), individually (tailored to the patient's eye) and with the guarantee offered by the manufacturer MarkEnnovy. Due to its specific manufacture, it has a wide variety of parameters in both graduation and radius of curvature, astigmatism values ​​and positioning axes, therefore, they are individualized for each patient, generating extreme comfort and vision lenses. • Multifocal Quarterly: for presbyopia with a duration of 3 months. • Conventional multifocal: for presbyopia with annual duration. • Conventional toric: correct astigmatism and annual duration. • Conventional Spheric: to correct myopia and hyperopia for annual replacement. • Quarterly Spheric: to correct myopia and hyperopia replacement every 3 months. • Quarterly Toric: correct astigmatism that is renewed every 3 months. All Quattro lenses have blue handling dye, a very useful complement so that the user has less difficulty when it comes to finding the contact lenses online in the case, therefore, the handling is easier. They include UV filter, a protection against ultraviolet radiation very important for the eye, although this filter does not eliminate the use of sunglasses, as an essential product to increase this UV protection to 100%. Why quarterly or conventional lenses? The conventional lenses are those (according to us as optical), which are used daily for about a year. These are recommended by price only, given that they age accumulating deposits of lipids and proteins, which can be harmful to the eye, if an exhaustive and correct daily and weekly cleaning is not performed (with an enzymatic cleaner). Quarterly lenses are replaced after 3 months of daily use. They also come out cheaper than the monthly lenses, but less than the annual lenses. The cleaning of these lenses must be careful, they must last the established time, without harming the health of the eye or the vision of the patient. If a contact lens breaks down, it is replaced easily by another. In Prodevisión you can buy cheap Quattro contact lenses quickly and with secure payment.